Francis Boag’s biggest solo exhibition for several years opens this Friday evening, 30 November 2018 at the Fraser Gallery St Andrews. Home to his 60th retrospective exhibition in 2008, this new show now celebrates the artists’ 70thyear. “This exhibition is even bigger and better than the previous one with more than 60 paintings on show, including some of the largest canvases I have ever attempted.” he said. Born in Dundee in 1948, Francis Boag is a leading figure amongst a group of painters often labelled the ‘New Scottish Colourists’. In a career spanning more than 50 years, he has taught in schools in Dundee, Perth and Aberdeen. His vivid, and instantly recognizable, paintings have found their way into a host of public buildings such as airports and hospitals and are sought after by large corporate collectors including John Lewis plc, Baxters Food Group and the Royal Bank of Scotland. “In 1964, at barely 17 years of age, I won a place at Duncan of Jordanstone College of Art and Design in Dundee and studied under the then Head of Painting, the larger than life, Scottish-Italian painter Alberto Morrocco and his Deputy David McLure, both of whom looked back to the great, pre-war French-based artists and had very little time for American Pop Art, even abstract expressionist artists like Jackson Pollock.” explains Boag. Upon graduation, Francis’ professional career was dictated by the rhythm of school life. After completing an MA at Gray’s School of Art in Aberdeen and nearly 30 years teaching, Francis decided to challenge the maxim, ‘those who can, do and those who can’t, teach’ and in 2001 went on to achieve a life-long ambition of making a career as an artist. His paintings are less about copying a scene, than creating a representation of it, a representation which has to be on the one hand a recognisable place or space but also a world where the imagination is unleashed. “Colour is what people expect of my work.” he says. Polls published in the press in Scotland and Ireland have both placed him in their lists of top 50 best-selling artists, and he is one of only a few artists who has work in the National Collections of both countries. For many years he has donated images of his work to the children’s charity, UNICEF who have recently published a Box set of his Scottish landscapes and in 2015 his Christmas card design was UNICEF’s top seller, raising more than £35,000 for the Charity. 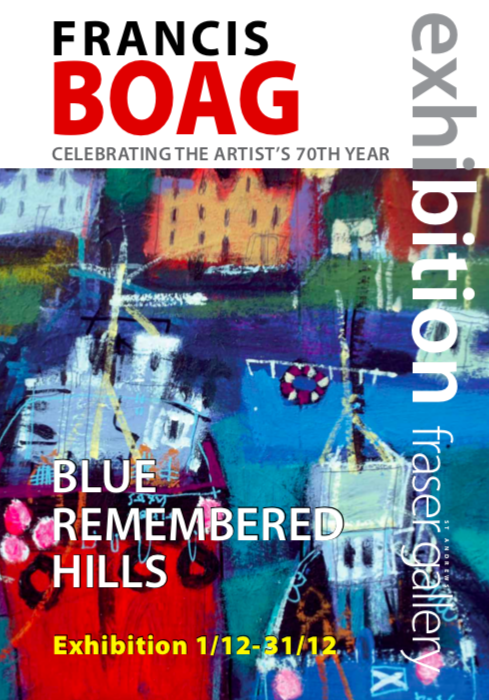 “Blue Remembered Hills” – a solo exhibition of new works by Francis Boag – opens this weekend with a Private View on Friday 30 November 2018, then runs from 1 December 2018 until 31 December 2018 at Fraser Gallery St Andrews, South Street, St Andrews. The works which feature in this exhibition are available to view online.